The CAMPINGAZ range, although primarily designed for the camping market, also contains some tradesmen and DIY-specific products. The brand was born in post-Second World War France when a unique, portable and refillable gas cylinder system called “bidon bleu” was invented and launched throughout Europe, which soon became a ‘must-have’ for campers. 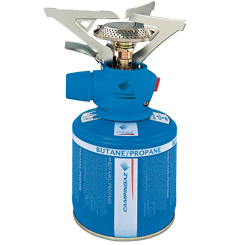 The refillable gas cylinder system was followed in the 1950’s by the CAMPINGAZ Bleuet stove with its revolutionary disposable cartridges, which established CAMPINGAZ as a household name across Europe. This disposable cartridge technology has resulted in the development of a range of products with many uses, with those popular in the trade and DIY markets including compact and lightweight blow torches and blow lamps and gas powered lanterns and gas stoves, all featuring the easy-to-replace gas cartridges, which are supplied in a variety of sizes. The range of CAMPINGAZ gas blow torches and blow lamps include those suitable for brazing and soldering, with piezo ignitions, solid, high-quality metal bodies and flame temperatures of up to 1850C, making them an indispensable part of many professional and DIY tool kits, especially those in the plumbing and heating trades. CAMPINGAZ lanterns and stoves provide a convenient, cost-effective and safe way of providing light and the ability to boil water or prepare food in locations where there is no access to mains electricity. Have a question about our Campingaz range? We‘ll be happy to help. Send us a message here.